A British officer created a panoramic landscape as seen from Beacon Hill as part of his duties in 1775. To the west , there was the Roxbury Meeting House, near Rocky Hill, where the rebels would fire into the British lines. Just north of there lay Ruggles Hill, an elevated, fortified post of Colonial militiamen armed with a “four and 20-pounder” cannon that could just reach the redcoats. 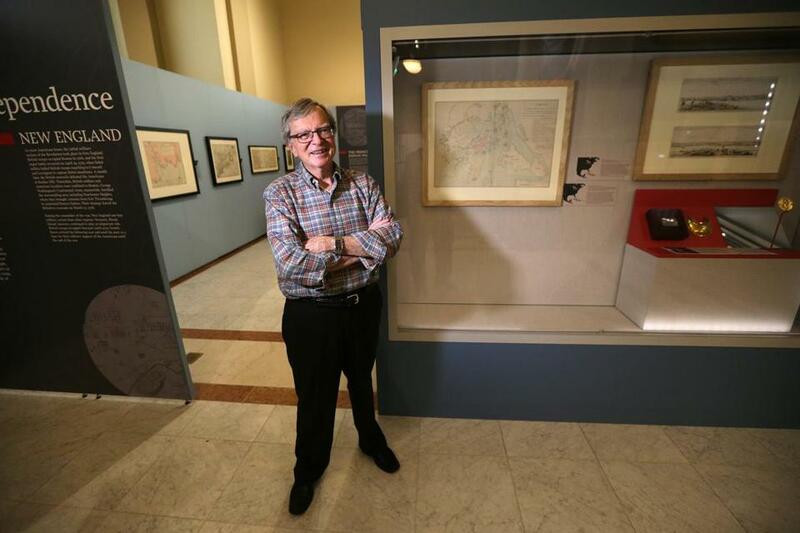 Look closely at the 18th-century map that’s now on display at the Boston Public Library’s main branch, and you can get a sense of a British soldier’s perspective of the battlefield in Boston at the start of the Revolutionary War. Lieutenant Richard Williams was tasked with creating the watercolor map, which he called “A Plan of Boston and its Environs,” in 1775. The meticulously drawn map provides an overhead view of the “true situation of his Majesty’s troops,” and positions of the rebel forces, during the British occupation in October of that year. The map is borrowed from the British Library’s King George III Topographical Collection, and will be on display, along with other works by Williams and an array of renderings from the second half of the 18th century, at the Boston library’s Norman B. Leventhal Map Center in Copley Square through November. A version of the map was published in London in March 1776, a week before the British were forced out of Boston by Colonial troops. Grim said obtaining the Williams map was special for the center, which operates as a nonprofit organization in partnership with the library, because namesake Norman B. Leventhal used to keep a replica of it above his desk. The developer and philanthropist died in April at the age of 97. “For us, it is very significant to have the [original] on display in our collection,” Grim said. Other works by Williams include two watercolor drawings that provide panoramic views of the Boston landscape from a vantage point on Beacon Hill. According to curators, one map shows British encampments in the foreground and George Washington’s headquarters across the Charles River. The other looks across the harbor toward Charlestown. The maps and drawings are featured in “We Are One: Mapping America’s Road from Revolution to Independence,” an exhibition that has been open since May. The latest maps are replacing other items that have been on display. The Leventhal center has also borrowed a map from the Connecticut Historical Society that illustrates Concord during the first battle of the Revolutionary War. Digitized versions of the maps and landscapes can be accessed through the center’s website, www.maps.bpl.org. “It’s really significant for us that we have been able to borrow these items from the British Library and have original manuscript materials that have never been in Boston before,” said Grim. Ronald Grim, as curator of the Norman B. Leventhal Map Center at the Boston Public Library, organized the “We Are One” exhibition.